A Spirited Tales gin tasting will help you to unravel the dizzying array of gins that seem to come onto the market almost weekly these days. Gin has enjoyed a remarkable transformation over the last twenty-six years. When Bombay Sapphire was launched in 1987, it was considered by some to be the first premium gin of the modern gin revival. By the turn of the century it had been joined by the likes of Hendricks, Martin Miller’s and South Gin. Now Melbourne has three distilleries within an hour of the city producing a number of varieties of gin and a good bottle shop can hold more than 100 brands. When British soldiers drank a spirit called Genever after the juniper berries which flavoured it in the 16th century to give them “Dutch courage” before going into battle, they could have had no idea of the rich and sordid future the drink would have. 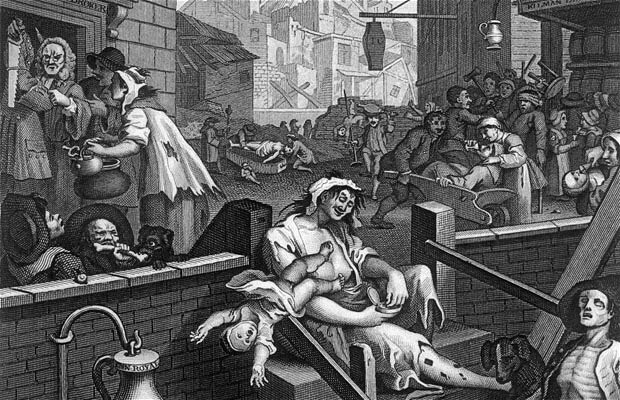 A century later Mother’s Ruin was the source of (or at least was blamed for) numerous social problems during the gin craze in England. With the popularity of the martini in the 20th century, gin started to become a respectable tipple, but modern times have seen gin reach new heights and take its place as a drink of fine quality. What happens at a Spirited Tales gin tasting? Your gin tasting can begin with a tonic making class, which is optional, but some customers prefer to taste the gin both by itself and with tonic. Our Gin Through the Ages begins with tastings of Dutch genever a descendant of the earliest gin. We then taste old styles like Plymouth and Old Tom, then some rejigged prohibition era bathtub gin following through with some 20th century brands or their closest living equivalents. We finish with a selection of 21st century concoctions. Our Gin Around the World is a selection of gins of various origins: English, Dutch, Scottish, Australian, New Zealand, and French. The New Style focuses on new brands, styles and techniques. The Old Style focuses on old brands, or old styles reinvented. Or we can build a gin tasting to suit your needs.